This pattern, a reworking of the "Felted Slippers" found on Midnattsol's blog is dedicated to Sally Fallon, a tireless worker to reach the masses with her message of how to be healthy. She's taken on the work of Weston A. Price, built upon what he started, and helps run the Weston A. Price Foundation (with a great group of other people like Mary Enig and Chris Masterjohn, to name a few). She co-authored the bestselling book "Nourishing Traditions" and has written several other books as well. Weston A. Price was the world's most interesting dentist. He traveled the world, living with Eskimos and headhunters to find out why tribal people had perfect teeth while those in the industrialized world had crooked teeth with lots of cavities - what he found surpassed his own expectations as the nutritional differences also seemed to produce overall health and even emotional stability. He then made it his mission to bring what he learned about nutrition and health to the attention of the public, publishing his book "Nutrition and Physical Degeneration" and running studies on nutrition in the cities of America. This is a fun way to make slippers. You knit a series of squares, in alternating directions, then sew a few seams and it magically becomes a slipper. Throw it in the wash to shrink it down and you get a wonderful warm soft cushiony slipper to warm your feet all winter. This is a great stashbusting project because each square can be a different color and you can use up all those odds and ends of wool leftover from other projects. If the yarn is too thin you can strand - use two or more strands together to make the thicknesses match. The only thing you need to be careful of is that all of the yarn you use needs to be "feltable" - that is, no superwash or acrylic here! Use wool. To begin, knit up a square of the yarn you want to use in garter stitch and put it through your wash and dry cycle to see how much it's going to shrink (if you're knitting these for a charity and it doesn't matter what size the slippers wind up you can skip this part!). Get your gauge for the project from the shrunken swatch. Then look up the size you want to make on my handy chart and see how big your squares need to be. In my chart I figured for 25% shrinkage but depending on the yarn it may be more or less so a swatch may be more reliable. You'll begin by making square 1, using enough stitches to get the size square you'll need, and making twice as many rows as you have stitches going across (so if you cast on 12 stitches you'll do 24 rows in garter stitch). You can easily count rows by counting ridges and you'll know you're done when you have as many ridges on both sides as you do stitches on the needle. In my example I'm using 10 stitches and knitting 20 rows, or 10 rows of ridges. After the first square, check that it is the right size (if you're using the chart) by tugging the sides out to make it square and measuring. Then bind off so you have just one stitch on the needles. From here on, you will always use the same number of stitches as in the first square to make the rest of the squares, and the same number of rows (sometimes one less on one side to make it come out at the right corner). Cast on enough stitches to get the right number for the next square, counting the one stitch you still have on the needles. This will be square number 2. Knit until you have enough rows for a square (same number of ridges as you have stitches - don't stop when it "looks" like a square). Bind off so the last stitch will be diagonal from where the current square is attached to square one. Again, keep the last stitch on the needle. Cast on enough stitches to make another square, like you did for square 2. Knit two rows. On the third row, knit all but the last stitch. Pick up the closest stitch you just bound off from square 2 by inserting the needle through one side of the loop. Then knit that together with the last stitch. Do this every time the row ends against square #2. Bind this square off so your last stitch will be down by square #2, keeping the last stitch on the needle. Pick up stitches from the edge of square #2 on the other needle. If you have more than the number you need, continue binding off until you have the right number of stitches on your needles. Knit this square as you did the last one, picking up stitches from the bound off edge of square #1 and binding off so the last stitch is away from square #1. Pat yourself on the back, you're halfway done! Pick up enough stitches along the top of the square you just completed to knit square number 5, picking up stitches from the bound off edge of square number 3 as you get to them at the end of the rows and knitting them together with the last stitch from the row. When you finish square number 5, bind off so the last stitch is toward square number 3. Pick up enough stitches from square number 3 to knit another square (you may want to bind off another stitch to make sure the new square comes to the edge of square 3). Knit square number 6, making sure when you bind off that the last stitch is on the correct side to pick up stitches from the edge of the square you just completed to knit square number 7. Knit square number 7, picking up stitches from the bound off edges of square number 5 as you come to it and knitting them together with the last stitch of the row. When you get enough rows on square 7, bind off so the last stitch is in the right position to start square number 8. Pick up stitches from the edge of square 7 and knit square 8, binding off completely when you finish that square. Now follow the diagram, matching up and stitching sides A and B, then C, D, and E. You've finished one slipper! When you finish both slippers, put them through the full wash and dry cycle, high heat, to shrink them down. If they are still too big, you can do it again to shrink them more. If they are just a little tight, they will stretch to fit the foot comfortably in a day or two of use. In case you want to use several colors and plan where they will be, here is the location of each square (unless you accidentally stitch it upside down! ): 1 and 2 are the side flaps. 3 and 7 are the sides. 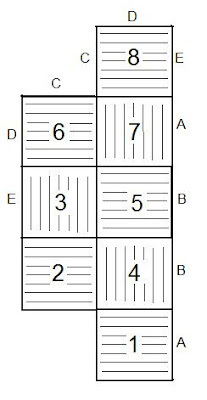 4 is the back, 5 is the bottom under the heel, 6 is the bottom under the toes, and 8 is the square on top of the toes. Added 11/7/09: To make them non-skid, the cheapest and so far best way I've seen is to use 100% silicone caulk. You can do lines, dots, words (hand wash, or right and left), or cover the whole sole and spread with a craft stick or grooved spreader for extra traction. I'm spatially challenged, evidently, because your seaming instructions are confusing! When I seam the A to B and C D & E, I don't get the shape of the slipper shown in your photo. Can you elaborate? Thanks! You need to match up the matching letters - sew A to A, B to B, etc. If you fold square number 1 up so it is on top of square 7 then seams A and B will be matched up and ready to sew. Sew side C on square 8 to side C on the square next to it (square 6), then just keep going around square 8 with seams D and E, matching them to the ones on squares 6 and 3. Thanks - I'll try that tonight! I am also having difficulties. I have 2others who are trying to work this up as well and we are all stuck at the end of row 3 on the 3rd square. You say pick up closest stitch...we all got that...but you say insert needle through one side of loop...we are all there. We are trying to figure out how to work from there. We have the last loop left on the left needle, but when we enter that needle into a bound loop, it is really difficult to enter the right needle. That is what we are wondering if that is right or wrong. Or are we suppose to pull the left needle out of the last loop then into the closest loop and then reapply the last loop back on. If you could post a picture that would be helpful.